If you’re looking for some inspiration, whether it’s for your personal closet or a line you’re creating, there’s no better place to look than the runways. Sure, runway fashions can be a bit over the top, but no matter how Avant-garde the outfits are, the elements that make them, such as an asymmetrical hemline or plaid pattern, will undoubtedly be the calling cards of the season. To help you take the sensational and make it work for you, straight from the NY and London runways, here are the 8 Biggest 2018 Spring Fashion Trends Anyone Can Duplicate. One of the biggest trends on the runway and the easiest to recreate is the Americana looks. Featuring stars and stripes, this look was spotted and gushed about from designers Raf Simons, Laura Kim and Fernando Garcia, and Phillip Lim and Maria Cornejo, among others. To duplicate this look for day-to-day living or as a piece in your line a crisp button-down shirt in stripes or shorts imprinted with stars can work. And as you’ll see from our list, vibrant colors and mixing patterns is also all the rage this season. Jeans to a wedding? Sounds preposterous- until you check out the fashions coming off the runway. Denim got a make-over, with designers such as Alexander Wang blinging them out or pairing them with chic tops for a night out at the fanciest parties. Taking a cue from the catwalk, if you are daring enough to go this route try a semi-formal place and choose glittery jeans in a neutral color, like tan or white, to give it a more upscale feel. Spring is all about bright sunshine so it makes sense that sparkles and sequins would be on trend this spring. 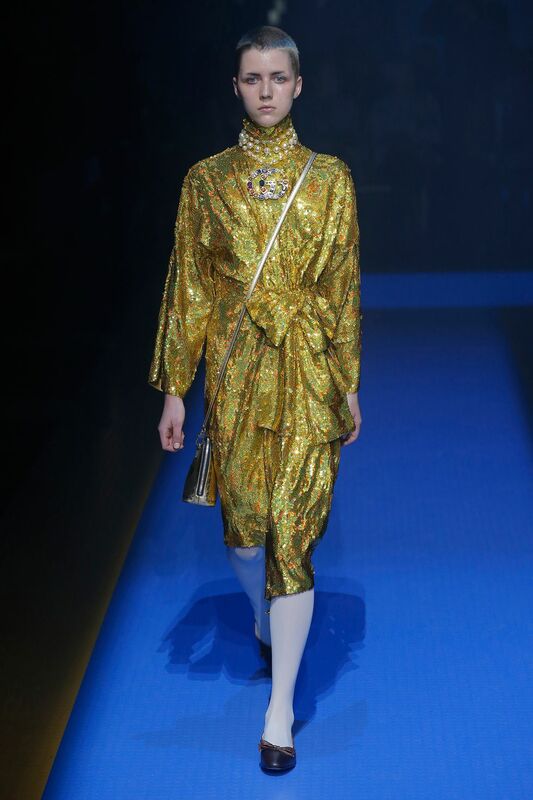 Tom Ford, Gucci, Dior, and Marc Jacobs all glittered and glowed in their runway shows and lucky for you this is a look you can easily duplicate. When it comes to sequins, when and where you wear them matters. Head to toe sequins are best used for a party or big event; for everyday outfits, mix a sequined tank or sneakers with solid pieces for an eye-catching look that’s doesn’t look out of place. It may be 2018, but don’t tell that to the designers, who were showing decidedly 90’s-inspired wear, Anoraks and windbreakers. They flooded the runways and came in all variations, from fun pastel everyday Anoraks to chic, gala-worthy options from none other Oscar de la Renta. This is a look you can easily add to your wardrobe, in different colors and materials. And if you feel inspired to create one for your brand, opt for a fun plaid (another spring trend) or use a funky pattern on the inside to make it your own. Fringe ain’t for jean jackets anymore as it was seen from Bottega Veneta, Lowe and others on the runway. The great thing with this trend is that it was shown in a couple of different ways, from long, flowing fringe that looked like a skirt to shorter, wilder fringe accents. As fringe can come off as a bit theatrical when it’s not done right, it’s important to balance your look. Try a long fringe skirt with a fitted top for a party or pair a fringe top with capri jeans. As long as you mix and match fringe with other traditional elements you’ll easily pull off the look. Taking their cue from the bright lights and glitz of the city, the NY runways were full of bright, rich colors. While Tom Ford did some interesting color blocking Carolina Herrera went with a monochromatic look. Either of these will work for you but try one vibrant piece, like a yellow top, as opposed to a whole outfit, to keep it understated and not blind everyone. If you want to try the color block look, use a subtler hue as the dominant color. 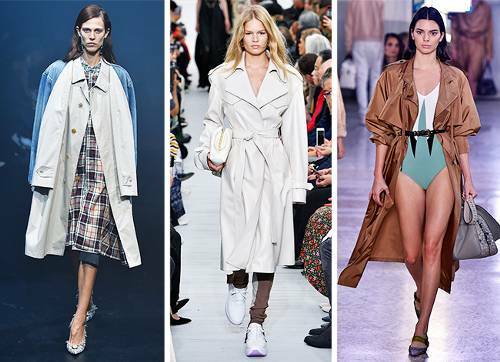 Sure, trench coats are a classic and technically always in style but this spring they’re slated to be one of the hottest trends. And while the traditional trench silhouette was the most popular style shown on the runways, with varying materials and colors, there were some variations, with puffed sleeves and faux sleeves making the rounds. The beauty of this trend is that you can’t go wrong. You can dress it up, dress it down, and choose just about any color, pattern and material. The shape is flattering to all figures and if I were you I’d get one in a classic color and one for stepping out on the town, like in a bright pink. And if you want to add this look to your line, you can have fun and add a funky print to the inside liner or a belt ina contrasting color. One of the major trends to come out of London is the mixing and not matching of patterns. Top designers, like Mary Katrantzou, didn’t shy from the idea, mixing bold florals and polka dots. Even Burberry got in on the act, with an understated mix of striped patterns and colors. As an everyday look, this one can be tricky, but it’s still possible. For instance, you could wear a small print while and navy polka dot top with a thin, pinstriped navy pencil skirt. And for the young and daring, go big with a floral skirt and striped top for a weekend with friends. Spring is all about those rising temperatures, so it’s no surprise that thin, sheer materials flooded the runways. Designers embraced this look, showcasing revealing outfits that were surprisingly elegant. These clothes left little to the imagination, but the cuts and designs are sure to spark your imagination. For the average guy or girl sheer needs to be done right and won’t work in every setting. Ladies, if you opt for a sheer, flowing skirt match it with boy shorts in the same color and a solid top; this creates a fun look that isn’t too over-the-top and can be worn for a brunch with the girls. Designers can have fun with this look too, using strategic solid panels to mix with the sheer to create eclectic designs. Just about every runway show, from Tom Ford to Tory Burch, showed ruching and while it may not be the easiest style to pull off, it is a great accent for any line. For those who want to wear it, you need to pay attention to where or how a piece is ruched as it tends to accent the area it lies on. As for designers, this element is ideal for jazzing up a simple style shirt or adding a bit of character to a pencil skirt. You can add it to almsot any garment, instantly elevating the look. Where NY was bright and in your face, London went the opposite route, showing lots of pastels. Almost every line used pastels, including J.W. Anderson, Peter Pilotto, and Emilia Wickstead. Pastels are an easy way to give your wardrobe an instant spring pick-me-up and is one of the trends you can go all out with. Whether you mix and match, such as pairing seafoam green pants with a pale-yellow tank, or go for a head-to-toe baby blue ensemble, you really can’t go wrong. And for those who want to incorporate this look into their line, you can pair a subtle pink with a military-style jacket or asymmetrical cut for a one-of-a-kind style. Speaking of military styles, the Utilitarian look was all the rage in Milan and is a look I personally love. And as these designers showed, zippers and pockets can be practical and fun. See Some of our Products to go along with your Spring Fashion Design this year as Woven Labels and Leather Patches. For designers I would suggest they have methods to their madness; in other words, place zippers in pockets in odd places, but ones that make sense. Like maybe add a mini pocket with a zipper on the shoulder of a shirt or jacket; it will look cool and can hold something small and thin, like an ID. Well, there you have it, the 8 Biggest 2018 Spring Fashion Trends Anyone Can Duplicate. I hope they inspire you this season and beyond to embrace everything there is to love about fashion.